Yes I know I know the Red Squirrel is not a pest, But I thought as we had gone into the biology of his American cousin we had better compare the grey with our native species...OK! 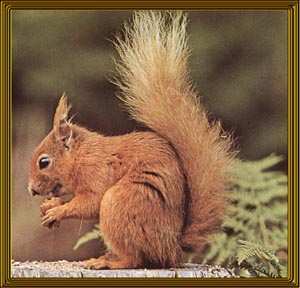 Despite a widespread belief, Britain's native red squirrel was not ousted by the larger and stronger grey squirrel, although individuals of the two species have been observed fighting. In fact they have been affected by a virus which decimated them and the greys moved in to take over the vacant territory. Head and body length: 180 - 240mm. Weight juvenile: 100 - 150g. Sexual maturity: Don't breed until at least 12 months.